Hello! 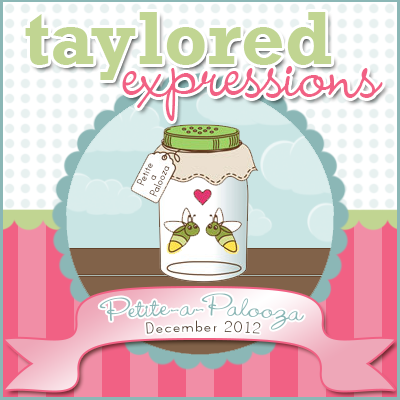 Welcome to the Taylored Expressions December Sneak Peek! Last year was our first Petite-a-Palooza, and you all seemed to love it, so we are doing it again this year! That means we'll be releasing 12 petite stamp sets (9 of which will come with coordinating dies)! You Take the Cake will also be officially available for purchase as well (you might remember that it was previously available with a qualifying purchase during our birthday celebration in September). Petite-a-Palooza features sets from all of our illustrators! These mini sets make great gifts for your crafty friends, or if you are new to TE, it's a great way to start collecting some new sets. We will be having a Preview Party tonight at 6:00 PM PST. This will be your chance to see the sets and some great giveaways. The party is always fun and fast-paced! Be sure to join along HERE! The Baker's Dozen team will also have new release projects to show you through Saturday! All new products with be available for purchase tomorrow, Thursday, December 6, @ 8 AM PST. You'll find everything in the Taylored Expressions store in the Fresh Out of the Oven Department, HERE! Today I have used two of the new Petite-a-Palooza sets. First up is Bonjour Couture, which was illustrated by Nancy McKinney as part of her Whimsical Wishes collection. I think you'll agree that it is tres chic and comes with 2 coordinating dress form dies! I used the smaller of the 2 dress forms on my card. I embossed it in white before using the coordinating die to cut it out. I used a classic pink and dark grey combination (papers are from My Mind's Eye Lost and Found 3 Ruby). I added my sentiment "Merci" to a small tag and tied it with some pink burlap twine. The next set that I used is called Tea-riffic! It was illustrated by Emily Burger and is part of her Embracing Grace collection. It comes with one die and also coordinates with the Mini Tags Dies. I used a scrap of patterned paper from my Merci card to piece the top tea cup, then I colored the rest with Copic markers and die cut the stacked cups. I used the Houndstooth/Damask Impression Plate (the damask side) on both of my Choice Buttercream layers. "hello" is from Many Minis - Occasions and stamped onto a heart Mini Tag. I used the new Labels Stacklets 3 (which was released on Black Friday). Accessories: Taylored Dies: Bonjour Couture coordinating die, Lace Chain Border, Mini Tags (Taylored Expressions), Long Rectangle Nestabilities (Spellbinders), Corner Chomper (WRMK), White embossing powder, Pink burlap twine (May Arts), Pearls (Basic Grey), Foam tape, Thread, Sewing machine. Accessories: Taylored Dies: Tea-riffic coordinating die, Labels Stacklets 3, Mini Tags, Houndstooth/Damask Impression Plate (Taylored Expressions); Markers (Copic), Ribbon (May Arts), Button, Hemp cord, Mini clothespin, Foam tape, Thread, Sewing machine. Your Bonjour Couture card is so pretty, Stephanie, and I love the colors you used on your tea cup card! Fab projects! Beautiful cards Stephanie, love the stitching! Very lovely card - great colors and layouts! 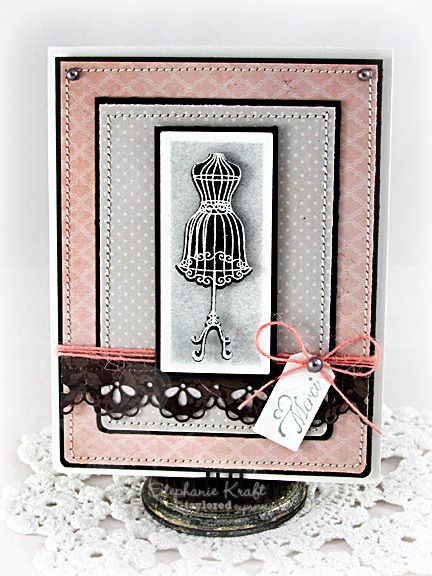 Oooh... love the black and pink and grey combo on your couture card! So striking! 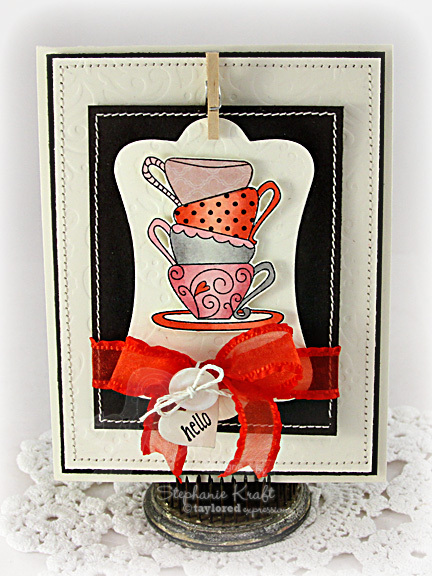 And your teacups card awesome too with the pop of black and the pretty, frilly ribbon! These are both stunning, Stephanie! I love the teacups and the little pin...the colors are gorgeous!